I've never been known to do things the right way. So it should be no surprise that I'm reading Kleypas out of order, having started this series after completing Hathaways.Book 1 in the Wallflowers series felt a bit slower than book 1 of Hathaways. I wasn't as invested in the conversations between the Wallflowers, but absolutely loved every single interaction between Simon and Annabelle. The scene after our heroine finds herself wounded with a snake bite was too cute. 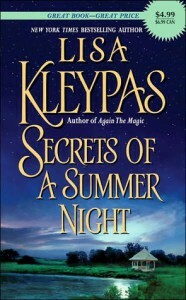 I've always been a sucker for unconventional heroes, and Kleypas has a certain flair for writing them.This was almost a 4 star book for me, but there were a few slow parts that knocked my rating down a bit. Nevertheless, I happily look forward to the next book. I can't wait for book 3, which I hear is a goodie.